“He came from nowhere.” That’s what people say about Evgeni Nabokov. The San Jose Sharks picked him at the very end of the 1994 draft, without ever having seen him play. They hadn’t even seen a video of his work in Ust-Kamenogorsk or heard any testaments from eye-witnesses. The Sharks’ scout noticed his name when he was visiting Kazakhstan and looking for a completely different player. He asked Nabokov if he was any relation to the former Soviet goaltender Viktor Nabokov. It turned out that Evgeni was Viktor’s son. Nabokov played the 1994 and 1995 seasons for Dynamo Moscow, after the capital city club was defeated by Nabokov’s Ust-Kamenogorsk team. Two seasons with Dynamo Moscow showed that Nabokov would make a unique goaltender. He has excellent reactions and is confident playing with the stick, demonstrating amazing saves. It was Nabokov’s talent that helped Dynamo win the 1995 trophy. Dynamo head coach Vladimir Golubovich let the young goaltender play in all the critical matches. After that, Nabokov understood that his skills belonged in the top ice hockey league across the ocean. After two years in a farm club, Nabokov got his chance at the big time in the second half of the 1999/2000 season, in a match against the Colorado Avalanche and their famed goalie Patrick Roy. Nabokov played brilliantly, repelling all of the 39 shots he faced in a 0:0 tie. In his first three matches in the NHL, he failed to stop only one of 58 shots. And the one goal he allowed was the result of a misunderstanding: his rivals broke the rules, Nabokov skated away to the bench so the Sharks could put a sixth player in play, but just then San Jose forward Patrick Marleau unwittingly struck his own goalpost. Since Nabokov hadn’t reached the bench, he was liable for the goal. In the 2000/01 season, Nabokov was finally able to try out as the number one goalie for the Sharks after Steve Shields hurt his ankle. The Sharks brass considered the Finnish player Miikka Kiprusoff the “goalie of the future”, but they decided to let him get more experience in a farm club and gave the starting position to Nabokov. This was a stopgap measure, but Nabokov played so fantastically well that the Sharks ended by trading Kiprusoff to Calgary. In 2001, Nabokov was awarded the coveted Calder Trophy for best NHL Rookie of the Year. In March, the New York Islanders confirmed the signing of the goaltender for one year. The 36-year-old Russian will get $2.75 million, five times his annual income in Russia. Nabokov is considered a very athletic and positional goaltender. He is known for his excellent positioning and ability to challenge shooters. His acrobatic saves in Cup series against Calgary and Dallas are legendary. 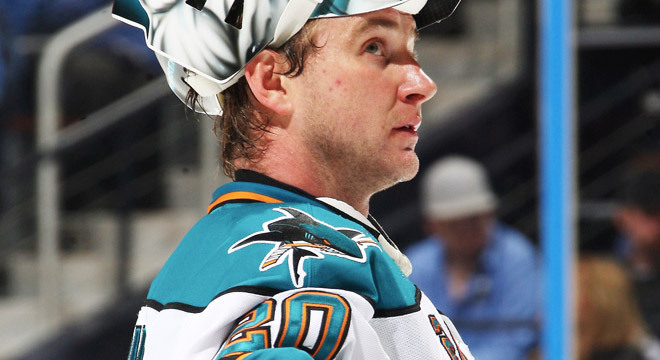 In addition, Nabokov boasts excellent stick work and in 2002 became the first net-minder in NHL history to score a power-play goal, in a match against the Vancouver Canucks. In 1994, Nabokov played for Team Kazakhstan at the World Championship, but in 2006, the International Hockey Federation made an exception for Nabokov and allowed him to play for Team Russia. At the Winter Olympics in Turin, Nabokov was remembered for his no-goal victory over the Canadians in the quarterfinals and for his mask, on which a shark was to be seen devouring a ship flying the flags of the rival teams. Nabokov has twice played in NHL All-Star Games. In the second, in 2008 in Atlanta, he stopped all eight shots that came by to him in the second period, twice saving shots by local favorite Ilya Kovalchuk. In 2010 Nabokov stopped a career-high 50 shots on the way to a 3:2 shootout victory against the Detroit Red Wings. This was also Nabokov’s 11th consecutive road victory, a new NHL record. Evgeni wears his number, 20, not in honor of former Soviet goaltender Vladislav Tretyak, but in honor of his father Viktor, who for many years was goaltender for Torpedo (Ust-Kamenogorsk). Nabokov met his American wife Tabitha while playing for Kentucky in the AHL. Born in Kentucky, Tabitha Eckler was then in college and waitressing part-time. Today, she and Evgeni have two children — Emma and Andrei John. In 2011 Nabokov cancelled his contract with SKA St. Petersburg “for family reasons.” His wife and children could not get used to life in Russia. His son in particular “had problems with the peculiar St. Pete climate” and spoke very little Russian.